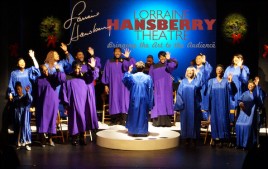 SAN FRANCISCO - Dec. 5, 2017 - PRLog -- Lorraine Hansberry Theatre's (LHT) joyful "Soulful Christmas: A Gospel Holiday Concert" returns for the fourth season from Thursday, December 14 to Saturday, December 23, 2017 presented in the Buriel Clay Theater at the African American Art & Culture Complex, 762 Fulton Street in San Francisco. San Francisco Bay Area gospel solo artist and Music Director, Yvonne Cobbs, conducts the legendary 16 member LHT Gospel Choir made up of both veteran and new choir members who sing inspirational holiday music -- both old and new, sacred and secular from Go Tell It On The Mountain and Hallelujah to I Saw Mommy Kissing Santa Claus. The show is a roof-raising, hand-clapping, joyful good time for all ages. Founded in 1981, Lorraine Hansberry Theatre, the West Coast's premiere African American theatre company, produced its first Gospel Music production -- James Baldwin's The Amen Corner -- 23 years ago. Since then, LHT has become renowned for its holiday gospel productions, including Tambourines to Glory and Black Nativity, both by Langston Hughes, the experimental Gethsemane Park by Ishmael Reed, and Vinnette Carol's classic Your Arm's Too Short to Box with God, among others. General Admission: $30 Adults, $25 Seniors (65+), $20 Students (with ID), $15 Children (12&Under). Add $10 for Opening Night that includes a pre-reception on Friday, 12/15 at 7pm. 20% discounts are available for groups of 10 or more. Purchase Tickets online at www.LHTSF.org. Tickets are available At-The-Door (pending availability). The Box Office opens one (1) hour prior to curtain times. Box Office: (415) 474-8800. Media interviews are available by arrangement. Call or email for more information or to arrange an interview.